The Lexington City Council has tasked City Manager Noah Simon and City Schools Superintendent Rebecca Walters with researching options for a possible high school facility. 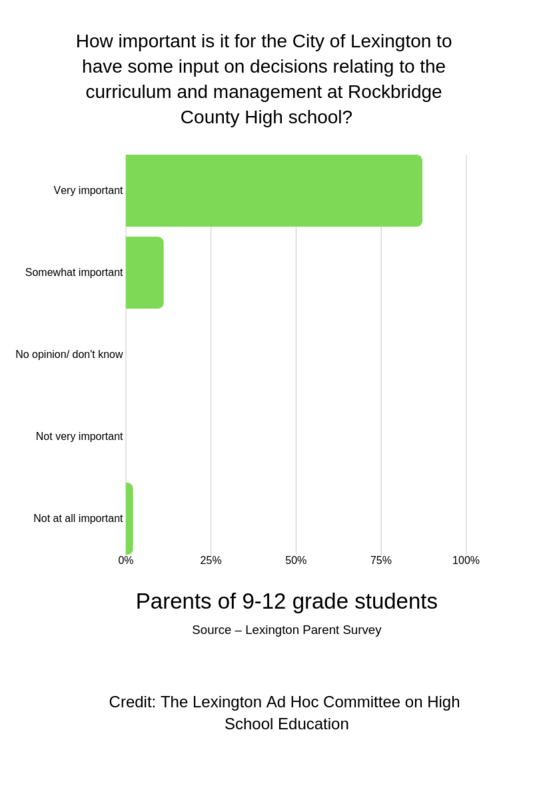 The council took the action at its final meeting of 2018 after a year-long study by a joint city council and city school board ad hoc committee assigned to evaluate the current high school arrangement and how it affects Lexington residents. City residents have sent their children to Rockbridge County High School since a 1989 agreement replaced Lexington High School and two other schools with the consolidated RCHS in 1992. The committee’s work included surveying parents about their children’s academic and extracurricular experiences at RCHS. The survey revealed mixed results about parents’ perceptions of the quality of the science, technology, engineering and math curriculum, the availability of college prep courses and options to participate in athletics at RCHS. Parents also were concerned about the lack of representation of city residents on the county school board. The committee’s study stopped short of recommending a specific location or estimating the cost of a new school. Council Member David Sigler said efforts should focus on improving RCHS instead of building a new school. The committee’s report has not yet been formally presented to either the county or city school board officials. The committee gathered data from both school districts’ databases, greatschools.org, a website that conducts research on K-12 education and the U.S. census, among other sources. According to the research, RCHS students perform well in geometry and geography classes. The high school also has a low student-teacher ratio of 13:1. But the school has low enrollment in advanced placement STEM classes. Former Council Member Patrick Rhamey said he is concerned about RCHS’s African-American students, who make up about four percent of the student body. He said they perform below average compared to African-Americans in other schools in the state. “I don’t want my kids to go to a high school that has a separate but equal educational environment,” Rhamey said. Other research showed that RCHS scored five out of 10 overall on greatschools.org. The school received low scores on college readiness, with a score of 26.2 out of 100 on USNews.com, another education research website. The committee also considered responses from surveys sent to parents with students at Waddell Elementary, Lylburn Downing Middle School and RCHS. The results were mixed, with about a 30 percent response rate from parents of students at Waddell Elementary and RCHS, but a 90 percent response rate from parents at Lylburn Downing Middle School. Eighty-seven percent of the high school parents who responded to the survey said they think it is “very important” for the city to have input in curriculum and management at the high school. About 15 percent of RCHS students are from Lexington. The consolidation agreement prevents the city from having a voting member on the Rockbridge County School Board. Lexington residents cannot run for the county school board because they don’t live in the county. But city taxpayers pay part of the RCHS budget, based on the proportion of Lexington students there. As a member of the RCHS Parent Teacher Student Association, Julia Woodzicka said she feels like she has a lot of influence. But, she said, it’s a “huge issue” that city residents lack representation on the county school board. Tim Diette, a member of the Lexington School Board and the ad hoc committee, said he understands the limits of the agreement but thinks the situation could be better. “I’m in favor of the county more actively seeking our input on big decisions,” he said. Diette said the city school board could do more to reach out to the county. He said the city school board tries to send a representative to attend every county school board meeting. But there is still more that could be done to improve communication between the two school boards, he said. The committee also made a similar suggestion in its report. Diette said he favors keeping a consolidated high school. With a daughter in the ninth grade, he has had personal experience with RCHS. Lexington’s city manager and the schools superintendent will report their findings to a joint council and school board meeting in October. Rhamey said he doubts that the city and county will follow the committee’s recommendations.